Permanent shoring is just what it says, shoring that is meant to permanently stay in place. Temporary shoring is usually just implemented during construction or repair to hold something in place until the structure is complete. Permanent shoring remains as part of the construction. There are several ways to go about implementing a permanent shoring solution. Some methods that Matthews Wall Anchor & Waterproofing uses include such tools as soil nails and tiebacks. It is important that the method used is strong, stable, and appropriate for the situation. Shoring is NOT a one-size-fits-all application. The civil engineers and structural contractors at Matthews Wall Anchor & Waterproofing will analyze the project and use the best method for each situation. There are many things to take into account, such as budget, the construction site, the structure being built, and other limitations. One method of permanent shoring is through the use of soil nails. These can be used to reinforce a soil mass or rocky area that is being built upon. Matthews Wall Anchor & Waterproofing can also install them in a factory floor to stabilize it in preparation of equipment that will remain in the factory. 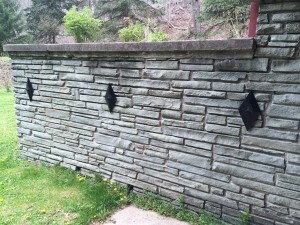 Many times we use them when installing a retaining wall. Soil nails are a good option as they supply support and strength to the area they are applied. The soil nails that Matthews Wall Anchor & Waterproofing uses come from Earth Contact Products and are 1-1/2″ to 1-3/4″ in diameter and five to seven feet long. If a custom size is needed, we can fabricate the length needed. The benefits of soil nails include a quick and easy installation, budget-friendly pricing, and durability and strength. 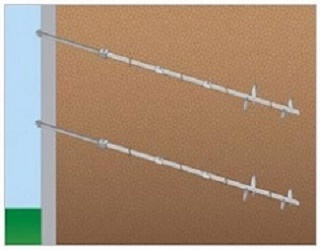 Another method that may be utilized for permanent shoring is the application of helical tiebacks. If the area has limited access or if the location is susceptible to vibrations or excavations, then helical tiebacks are the best alternative. The installation of helical tiebacks uses less machinery and crew members and can be installed quicker than some other methods. A hydraulic drill installs them and our civil engineers will help determine the load capacity during installation. The ECP plate anchor is made up of two 10-gauge plates that are made from hot-rolled steel. They measure 12″ x 26″ and have embossed reinforcing ribs to make them even stiffer. They are held together with a 4″ square, 10 gauge square washer to provide even more strength. These plates aren’t going anywhere once they are set. The wall plate and anchor are connected by a 3/4″ rod that is continuously threaded. The entire assembly is galvanized to resist corrosion. Matthews Wall Anchor & Waterproofing uses tools from Earth Contact Products, the recognized leader in the industry. We know that we will have the right tools and products for the job and our crews will be able to do their job right the first time. Our years of experience, paired with these outstanding products, will ensure that your wall will stay put for years to come. Strength and durability are guaranteed when you work with Matthews Wall Anchor & Waterproofing. Contact us today to learn more about permanent shoring and if it is something your project could use.